Pick it as an option for your breakfast, lunch or evening supper, these unconventional crunchy salads add to a sumptuous and healthy meal. Ideally, they are complete meal in itself but best enjoyed with some crispy toasted bread and soup along with. 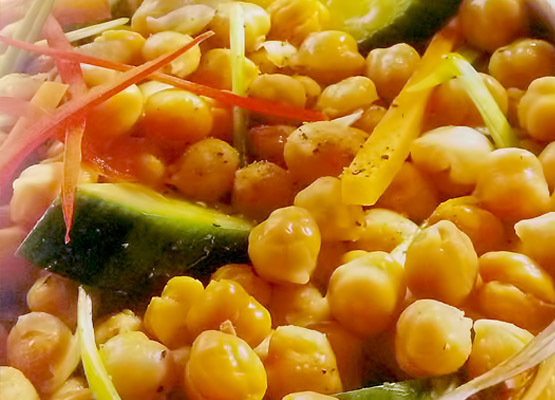 Chickpeas or Garbanzo beans are a high source of protein, dietary fibre and also iron, zinc and phosphorus. So, here’s bringing you two different chickpeas salad options, which healthy, wholesome and tasteful, all at the same time. *If you do not want to use canned chickpeas from the market you can always boil some at home. Just soak them overnight and boil in pressure cooker with salt as per taste and drain out all the water once it’s cooked. Slice carrots, cucumber and spring onions and keep aside. Add the carrots, spring onions and cucumber to the chickpeas and mix well. Sprinkle salt and pepper and add the lemon juice. And mix well again. Deseed and slice the red pepper into thin strips and garnish the salad with pepper slices on top. The salad should be served immediately or else keep in refrigerator before serving. Cook the sweet potato in a large saucepan of boiling water for 10 minutes. Add the carrots and cook for a further 3-5 minute, or until the sweet potato is tender, but still firm to the bite. Drain well and place in a large bowl. Add the chopped tomatoes and chickpeas to the sweet potato and carrots and mix together thoroughly. 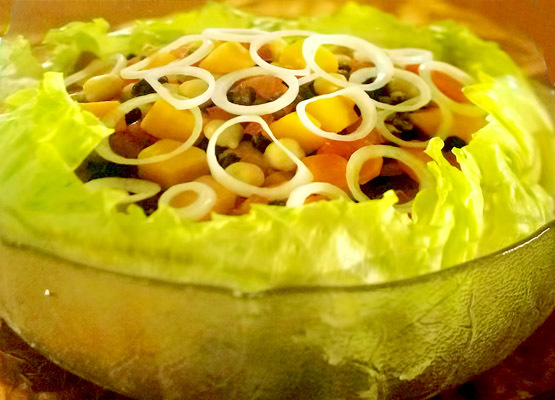 Line a salad bowl with the lettuce leaves and spoon the vegetables mixture into the centre. Sprinkle with the sultanas, walnuts and onion rings. To make the dressing, place the yogurt, honey and pepper in a small serving bowl and whisky thoroughly with a fork and add salt to taste. Serve the sweet potato salad warm and hand around the dressing separately. A complete foodie by choice, Lokesh likes to indulge in trying new and interesting recipes from all cuisines. Coming from the corporate world, what started as a de-stress call, soon became a passion. Today, he has his own fanfare waiting for him to start his own eatery.